The Food Safety Modernization Act, or FSMA, as it is more commonly known, is the foremost reform of the United States' food safety laws in over 70 years. FSMA directs the U.S. Food and Drug Administration (FDA) to ensure the U.S. food supply is safe by shifting focus from responding to foodborne outbreaks to implementing risk-based measures to prevent them. FSMA passed into law in 2011 and the FSMA Rules become effective on a timetable found on the FDA webpage. FSMA encompasses the seven Rules below that integrate preventative food safety measures into the entire U.S. food supply system. While the purpose of this webpage is to address the Produce Safety Rule, if you are interested in whether any of these other Rules apply to you, please click on the following links. The Produce Safety Rule is the first mandatory federal standard for the production, harvest, and handling of fruits and vegetables in the U.S. in an effort to prevent foodborne illnesses associated microbial contamination of fresh commodities that are typically eaten raw. Typical commodities grown in New Mexico that would be covered by the Rule include lettuce, cabbage, chile, onions, melons, apples, peaches, pistachios, and pecans. The full list of commodities that are covered by the Rule. Follow the instructions in the table below to find out if the Produce Rule applies to you. How Does the Produce Safety Rule Apply To Me? Who Should Attend PSA Grower Training? Fruit and vegetable growers and others interested in learning about produce safety, the Food Safety Modernization Act (FSMA) Produce Safety Rule, Good Agricultural Practices (GAPs), and co-management of natural resources and food safety practices. What to Expect at the PSA Training Course? In addition to learning about produce safety practices, key parts of the Produce Safety Rule requirements are outlined within each module. There will be time for questions and discussion, so participants should come prepared to share their experiences and ask questions. Benefits of Attending the Course? 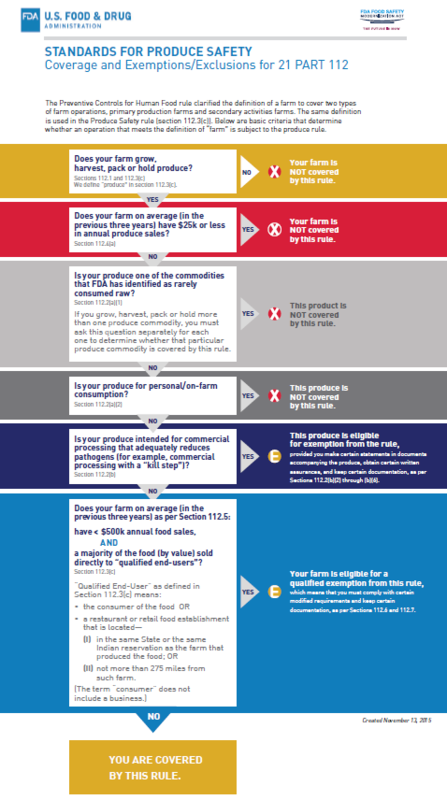 Information about compliance dates for the FSMA Produce Safety Rule is summarized in the following table where you can see the specific regulatory compliance dates for the different parts of the Rule. 1) According to the Proposed Rule, issued on 9/13/17, Compliance dates for Subpart E, Agricultural Water, allow an additional four years. 2) A farm eligible for a qualified exemption must notify consumers as to the complete business address of the farm where the food is grown, harvested, packed, and held. 3) A farm is a small business if, on a rolling basis, the average annual monetary value of produce sold during the previous 3-year period is no more than $500,000. 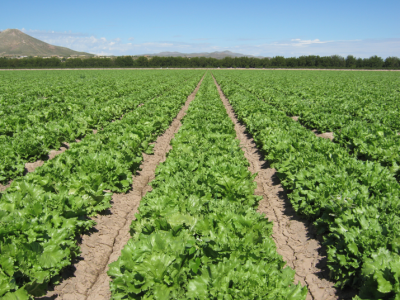 4 A farm is a very small business if, on a rolling basis, the average annual monetary value of produce sold during the previous 3-year period is no more than $250,000. In New Mexico, New Mexico Department of Agriculture (NMDA) will be the regulatory agency overseeing the implementation of the regulations. For additional information, visit the NMDA website. The NMSU-CES offers PSA Grower Training and On-the-Farm-Readiness-Review to producers in the state. See Upcoming Grower Trainings in New Mexico on the tab listed. How Do I Get More Information About the FSMA Produce Safety Rule? There are a number of ways you can stay up-to-date with regulation. Sign up for the PSA general list. We send updates as we receive new information on the regulation, as well as educational opportunities and other produce safety information. Sign Up for Local Information. Attend a training. Sign up for the PSA listserv for the latest information on when training is available. Sign up for the FDA's e-mail updates.